Hello my lovelies! To those of you celebrating these days, I wish very happy holidays! Can't believe it's already Monday, which means that there's only one week left of my vacation. I know that it seems a lot but time surely flies by when you're having fun. We've been getting a bit of snow here these days and what better way to enjoy it than with a thermal polish. I think the best season for this type of polish is the cold one, because you can play with the different temperatures around you. I also managed to grow my nails a bit, which also helps with emphasizing the thermal effect. 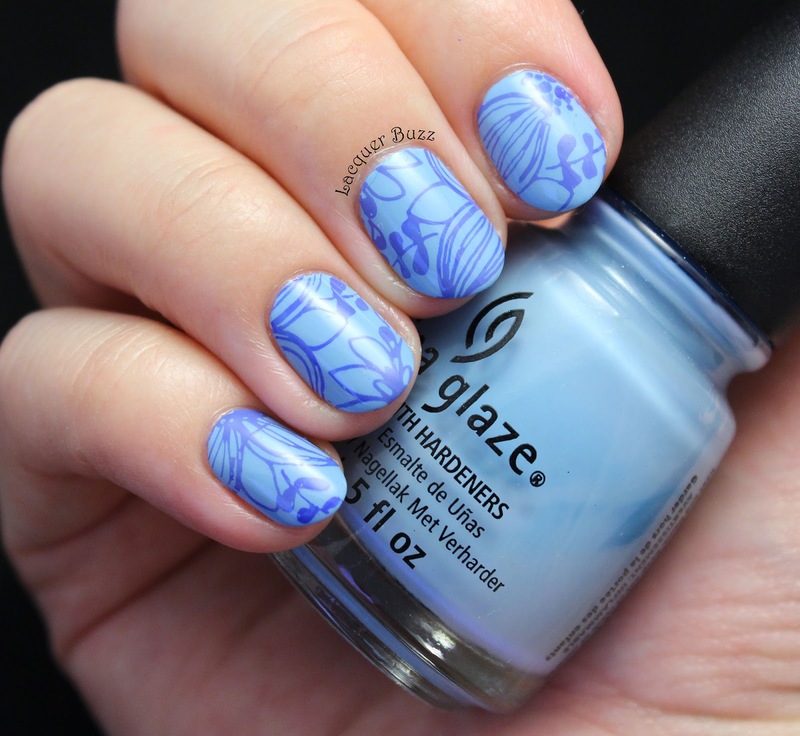 Monday Blues: China Glaze Blue-Ya! Hello my lovelies! Today I'm happy to announce that I'm already on holiday. Not much to do but relax and enjoy myself for two weeks. I know not everyone is as fortunate as I am so of course I have a blue polish to cheer you up if you still have to go to work. It's been a while since I purchased a China Glaze polish, but even though it's my favorite brand I try to limit my purchases since I already have a huge collection. 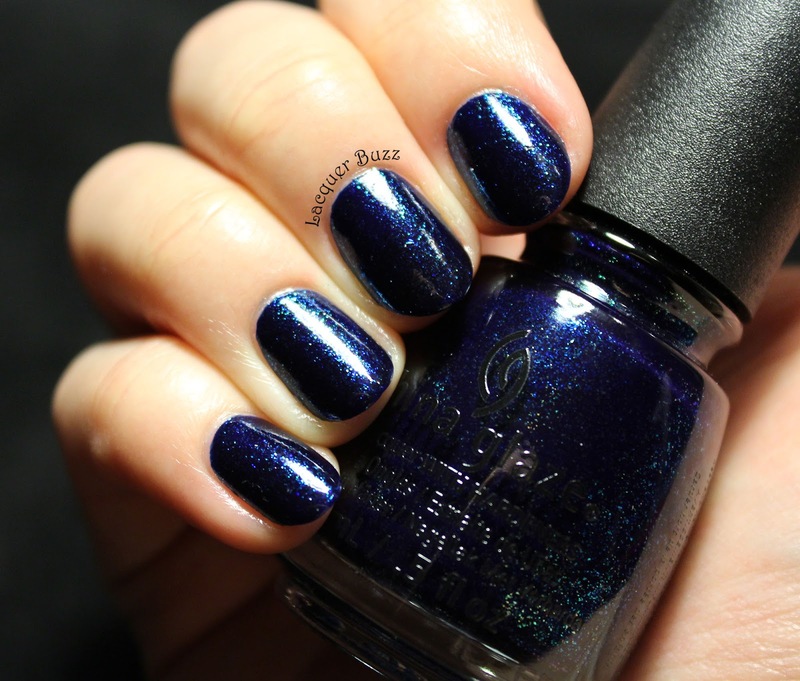 With this polish it was love at first sight and I had to get myself a bottle eventually. I was happy to see that it's so much better in real life than it shows up in pictures. My pictures don't do it justice at all so, I will try to compensate with words. Hello my lovelies! Is it just me or is Monday the busiest day of the week? I don't know hot it happens but I always have lots of stuff to do on Monday. Preparing this post is one of those things and I wouldn't miss it for the world. I know that everyone is doing only holiday related manicures these days but this week I decided to go for something a little different. I wanted to use one of my new p2 polishes that a friend got me from Germany a few weeks ago and I decided to pair it with some blue stamping. This is what came out. Hello my lovelies! It's been over 4 years since I started posting my Monday Blues and I never missed a week until last week. I always prepared my posts in advance, I scheduled posts when I went away and did my absolute best to have a post ready before the end of Monday. Unfortunately, I had an unscheduled event last weekend and combined with the crazy day that is the first day of the week plus a nasty cold I just couldn't create a manicure for you. I was disappointed but at the same time I knew that one day it will happen so I didn't beat myself up too much about it. I will still do my best to show you a blue manicure every Monday from now on. The one I have for you today is kind of a winter tradition for me. 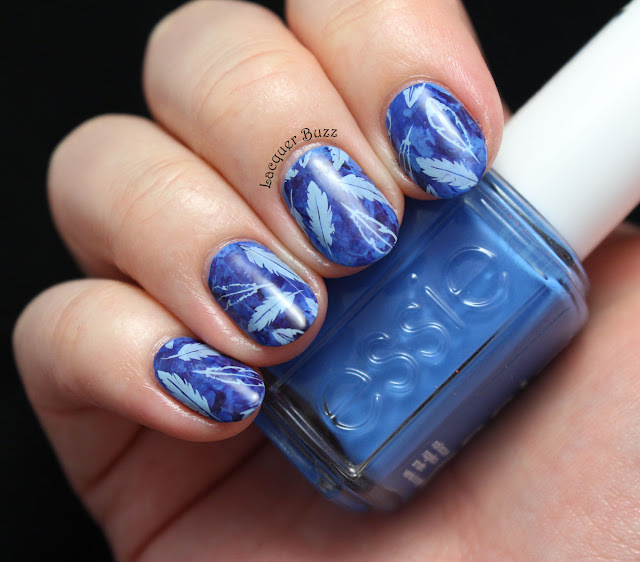 This polish is one of my favorite blues and every year I create a winter manicure using it. Hello my lovelies! Hope your Monday isn't too busy or cold. I have lots of stuff to do this week but I'm trying to stay on top of things and not get stressed out. To put us all in a better mood, I have a manicure with an old classic to show you. 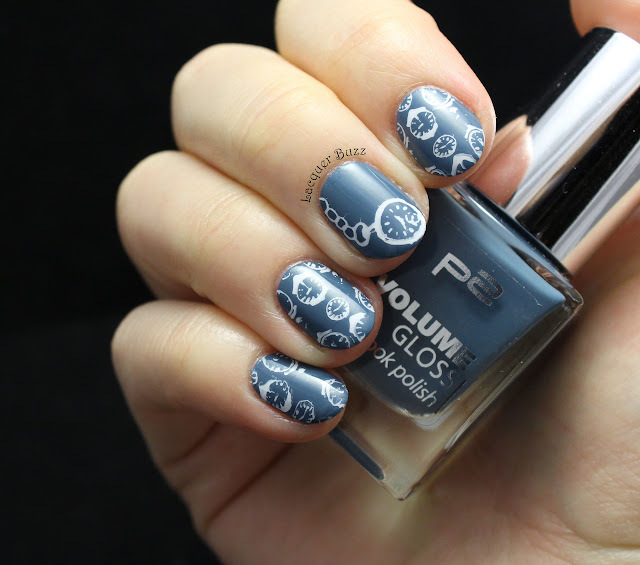 It was inspired by Ohmygoshpolish, although it's quite a bit different than her original manicure because I used a blue base instead of a black one and a different image for the stamping. I did, however, keep the main idea of stamping with light blue over a dark jelly. Here's my result. Hello my lovelies! It's been a very eventful week for all of us and for me it ended with snow. Just last week I was complaining about autumn and then winter was upon us. I surely wasn't ready for even colder weather, not to mention shoveling snow. Only my nails were on point because I chose a color that is very winter appropriate. 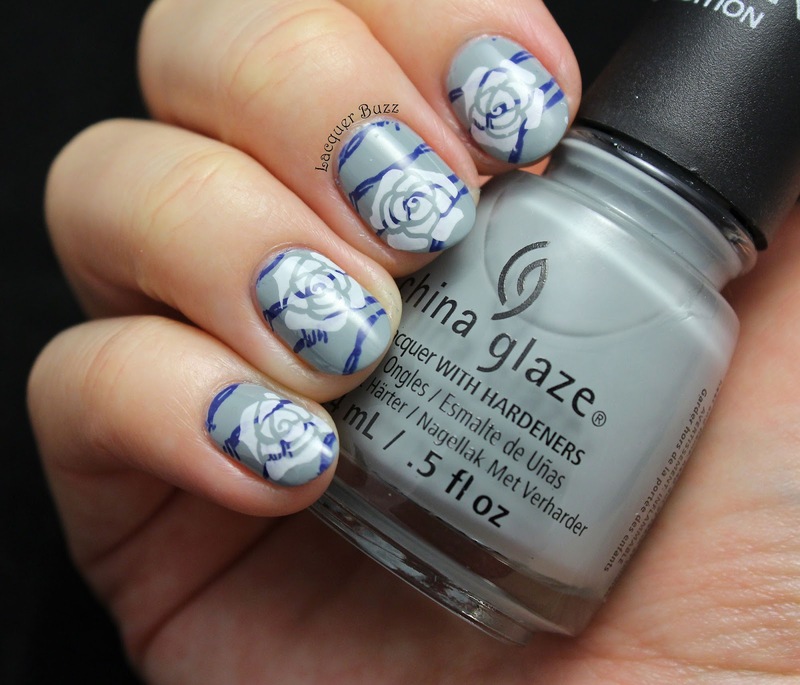 The white stamping on top almost looked like snowflakes from a distance. But they were actually clocks. Let's take a look! Hello my lovelies! It seems that the cold is giving us a few days off, at least where I live. I am not a big fan of autumn so this is great news for me. I know a lot of people love this season, so I must be the only one who doesn't like it. I just hate cold weather and rain. Last week, in the hope of feeling a little better about the weather outside, I created some nails inspired by fall leaves. I wore them for a whole week and enjoyed them quite a lot. Here they are! Hello my lovelies! Happy Halloween! I don't usually celebrate this holiday since there's no real tradition for it in my country. Nobody goes trick-or-treating here, so there's no point in Halloween without candy. But I was in the mood to do some themed nails this year because I haven't done any in ages. 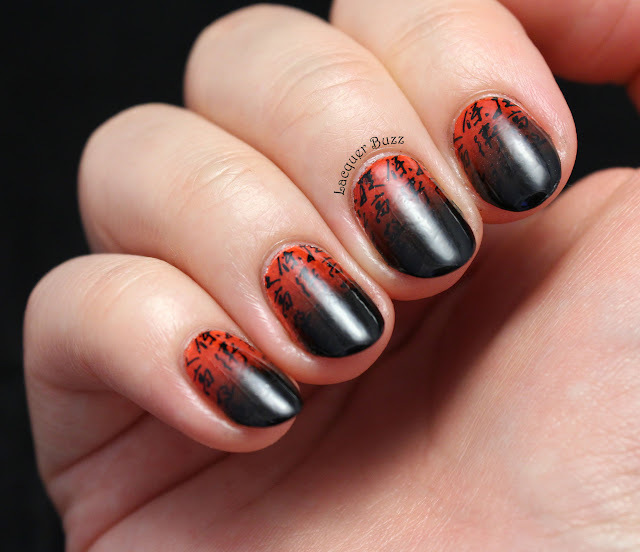 I then realized that I have very few Halloween stamping plates, so I didn't have many options. I finally got inspired by the immensely talented Ohmygoshpolish to freehand some creepy eyes. Of course mine aren't as cool as her's because she used a magnetic polish but I still think they came out ok.
Hello my lovelies! How's your Monday so far? I decided to have a long weekend so I took today off to catch up on my rest. 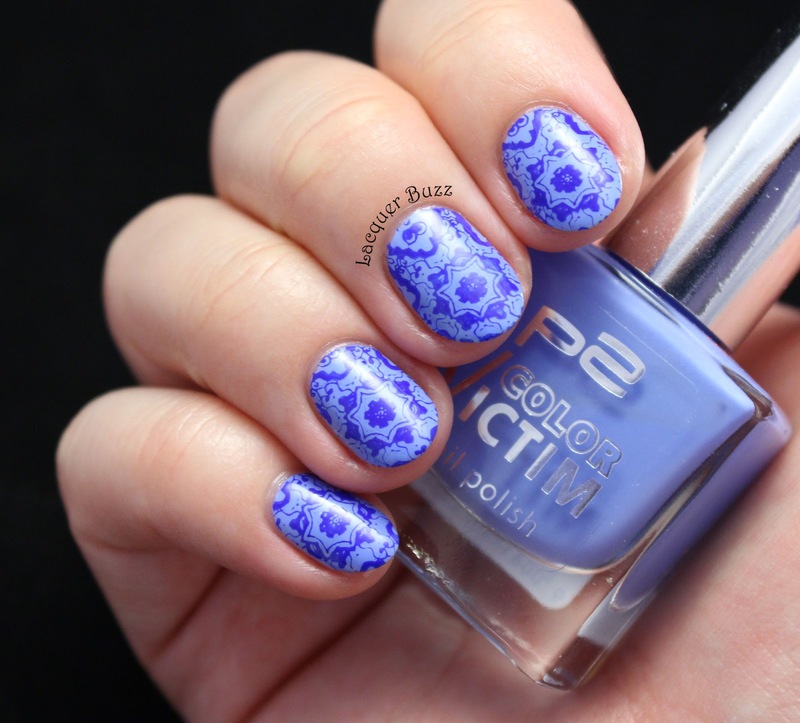 I have a fun new stamping plate to show you today, along with the blue manicure that I created using it. There are quite a few Moyra plates in my collection, and I am very fond of them because they have beautiful and original designs for an affordable price. 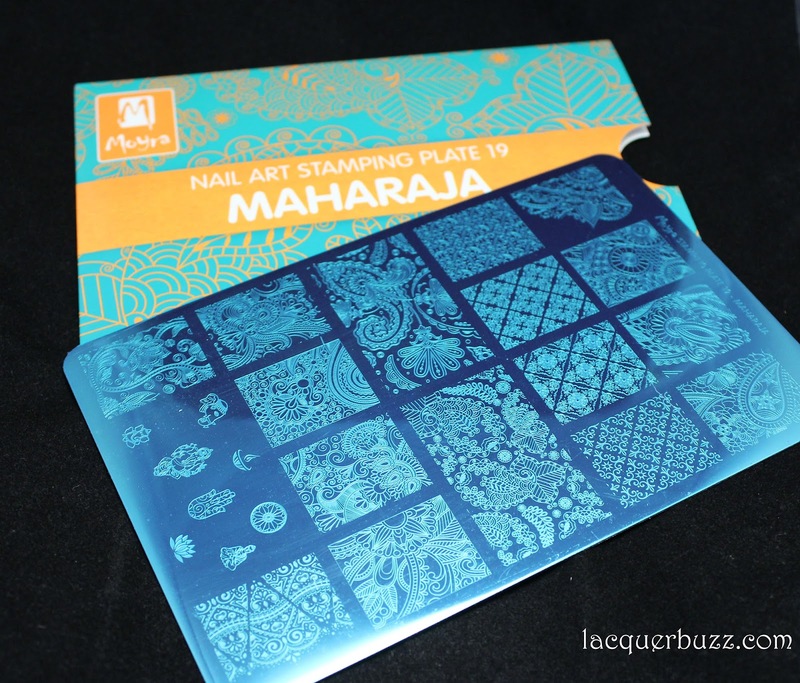 Not all my Moyra plates stamp perfectly (reviews here, here and here), but most of them are good quality and I think they've learned from their mistakes because the last ones I've purchased are top notch. The one I'm showing you today came out this year and I'm happy to report that I had no issues with it. 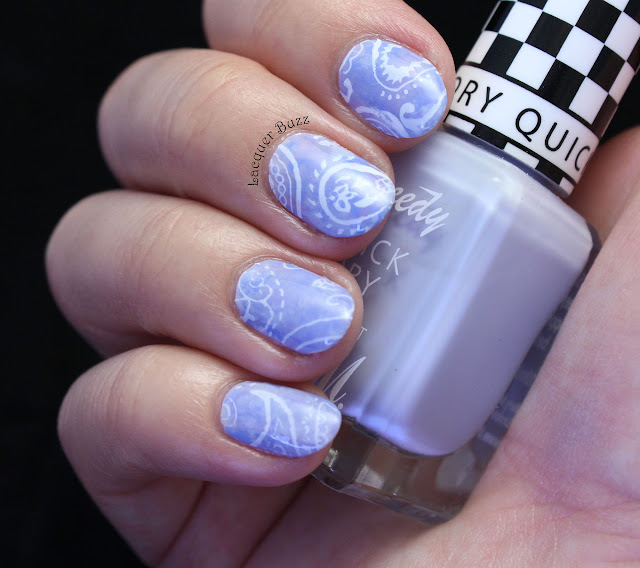 Here's the manicure I created using it. Hello my lovelies! It's been a crazy Monday for me, but at least I managed to get everything done. It's now almost dinner time and I plan to relax a bit, but not before I write this post for you. This weekend I went through my older pictures and realized I had a few unposted manicures. Most of them are not blue, but there is one that has a bit of blue in it. 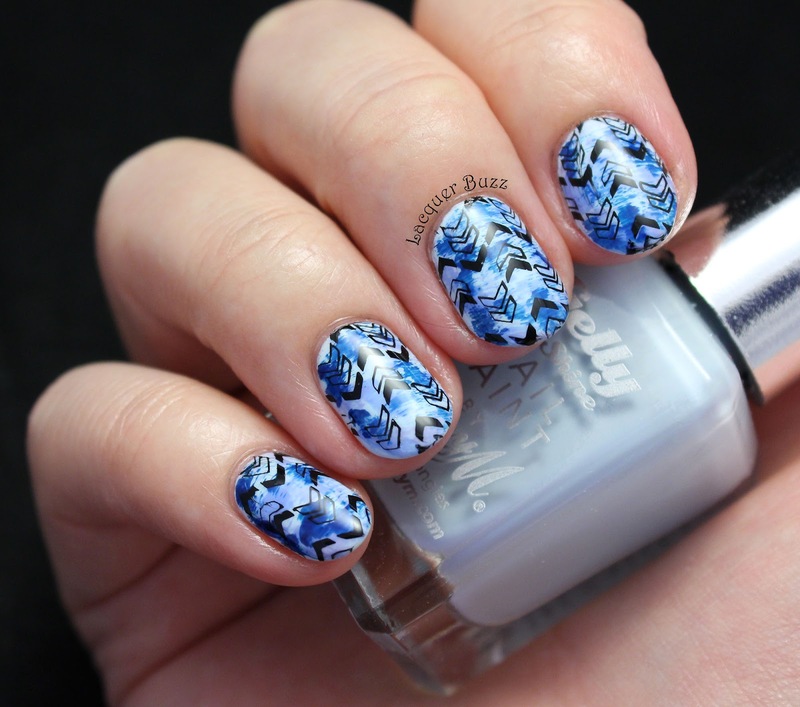 So in the interest of getting rid of my backlog, here's a double stamping I did a couple of months ago. 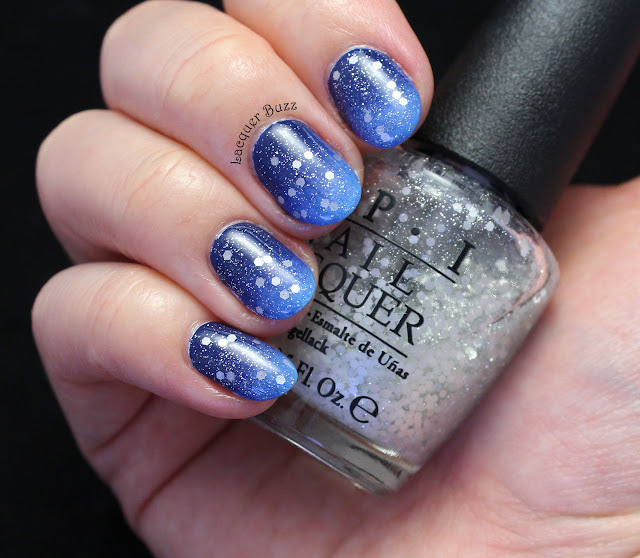 My nails were very short then and I think this sparkly manicure looked perfect on them. Hello my lovelies! 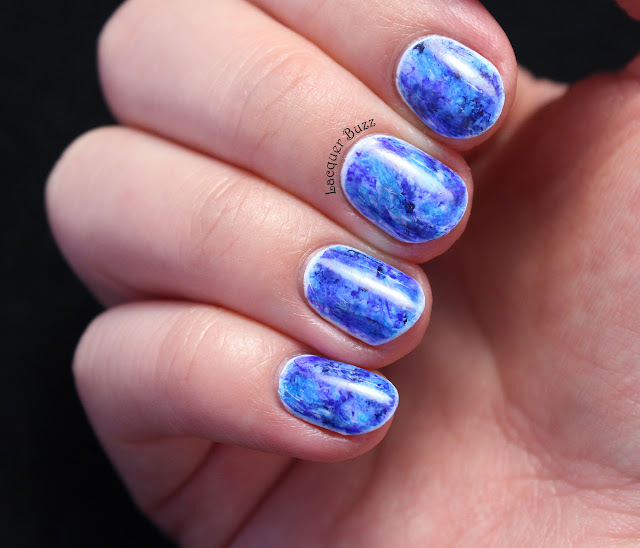 It's Saturday and I haven't posted anything except for Monday Blues for a really long time, but today I decided it was time to show you some manicures that have been on my waiting list for ages. The first one is a summer nail art that I created back in August but didn't get to post. I know it's totally out of season and it seems kind of weird for me to post this now, but I really like it and now that I rediscovered it in my folders I can't help but show it to you. Plus is reminds me of summer which is always nice on such a cold gloomy day. Hello my lovelies! Let me start by saying that today's weather is really giving me the blues, Monday Blues that is. It's been raining all day and I just hate it. The only thing to lift my spirits is the manicure I'm about to show you. I created this one by getting inspired by fall colors. For me the good fall colors are beautiful shades of grey, dark blue, purple and even a bit of orange. None of that brown and khaki if it's possible. So I took these shades (with the exception of orange) and combined them in a manicure. The final result makes me really happy. Hello my lovelies! It seems that time is flying by because September is almost over. The past week has been quite cold where I live, so the autumn feeling can't be avoided anymore. This time I got inspired by tones of grey and I added some double stamping to spice things up a bit. This is what came out. Hello my lovelies! I don't know about you but I'm really feeling the Monday Blues today. The weather is slightly chilly and rainy, so it feels like real September weather. I didn't mind holding on to summer a bit longer but what can you do? Last night I got inspired by Autumn and created a dark blue manicure. I used a polish that I almost forgot I had in my collection. Here's what came out! Hello my lovelies! Hope you are doing great on this busy Monday! The weather is still really hot where I live so I can't help but feel that summer is not over yet. That's why I decided to wear some flowers on my nails this week. This manicure really reminds me of spring and I don't mind at all. Let's all enjoy the sun until we are able to because we are sure gonna miss it in the next months. Hello my lovelies! It's the last Monday of August, which makes me a little sad. I love summer because I hate the rain that makes me stay inside all day and that's what is coming up once fall is upon us. I decided to enjoy the last days of summer by taking a day off. 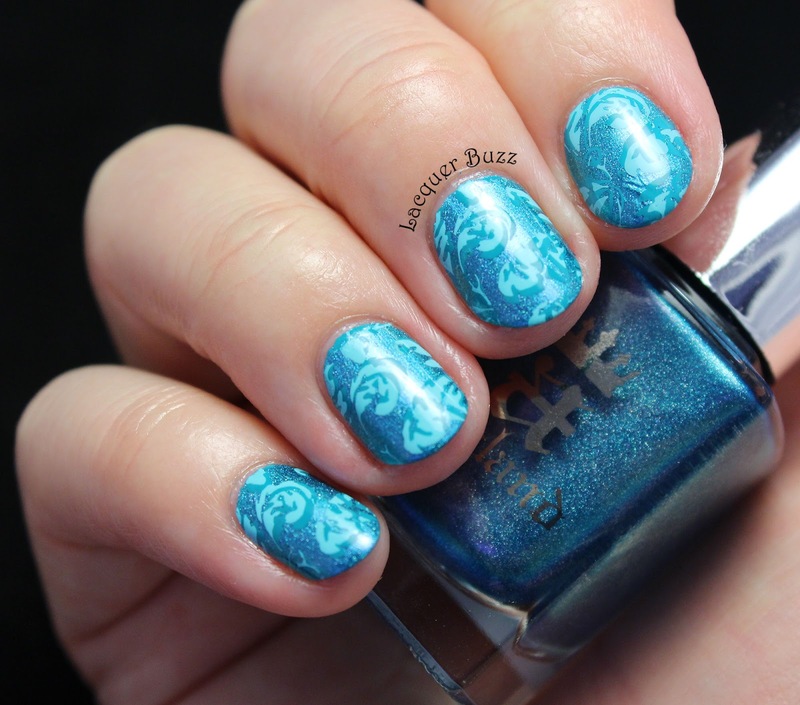 One of the tasks for today was doing my Monday Blues manicure, so I decided to experiment a bit with some holo polishes and the result wasn't what I expected. I wouldn't call this a fail because the stamping really saved the day in this case, but the original idea was a bust. Oh well. Hello my lovelies! Another weekend has passed and it's time to get back to work again. I haven't slept too well last night so the first thing I did today after work is take a nap. Hopefully this week gets better once the Monday point has been surpassed. 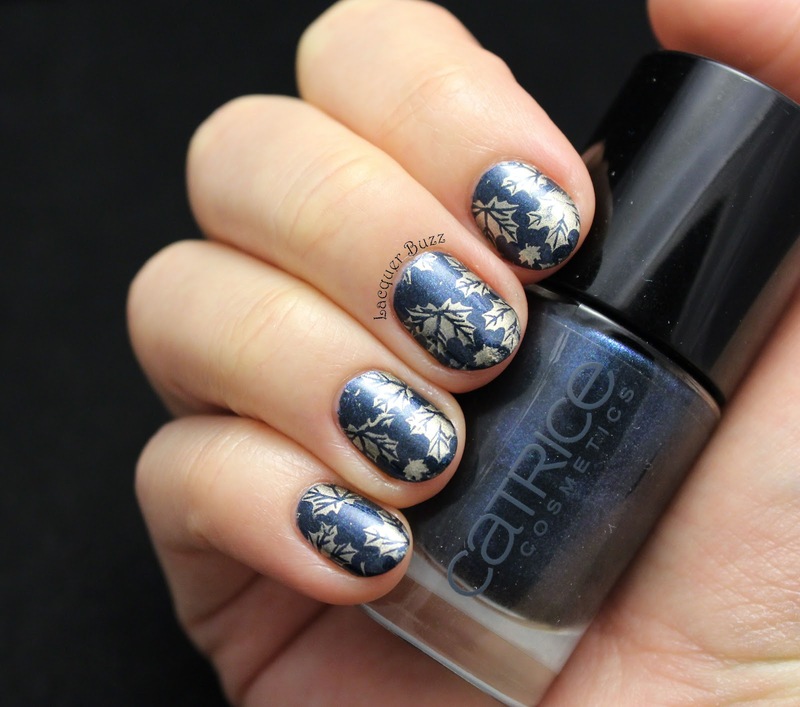 Today I have some stamping in an elegant manicure to show you. The name might look a bit odd at first, but I can assure you that one of the polishes has neon in its name. Let's take a look! Hello my lovelies! I'm pretty excited that today is a holiday so I didn't have to go to work. I'm not sure how many countries have a holiday today, but for those of you who have to work I have some dreamy blue nails to take your Monday Blues away. I am not even joking, I actually had a dream about this polish a couple of nights ago. It's pretty weird because I haven't used this in years, probably since I first got it. And I think it's been mine for about four years. I don't know how it came to that, but I remember that I was looking for it in my Helmer. So naturally I had to use it in a manicure. 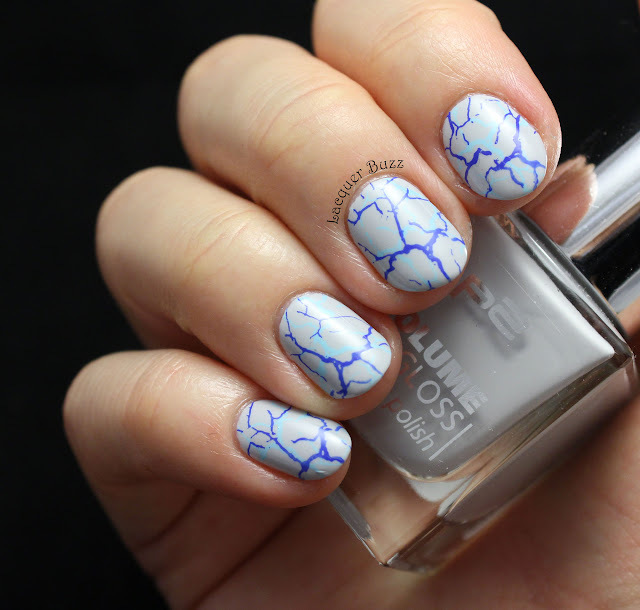 I paired it with some waterfall nail art that goes well with how delicate this polish is. Hello my lovelies! I am back! I had two relaxing weeks with lots of traveling and a bit of adventure too. I don't regret being back because I missed my home and doing my nails, but going back to work is always hard. Today's manicure isn't particularly complicated because I didn't have a lot of time to do it. Instead I spent a lot of time filing and cleaning my nails because they were a hot mess when I came home. After that I only did some simple stamping over a color I love and haven't used in ages. I promise that I will do something more complicated in the next days. But until then, here's today's manicure. Hello my lovelies! 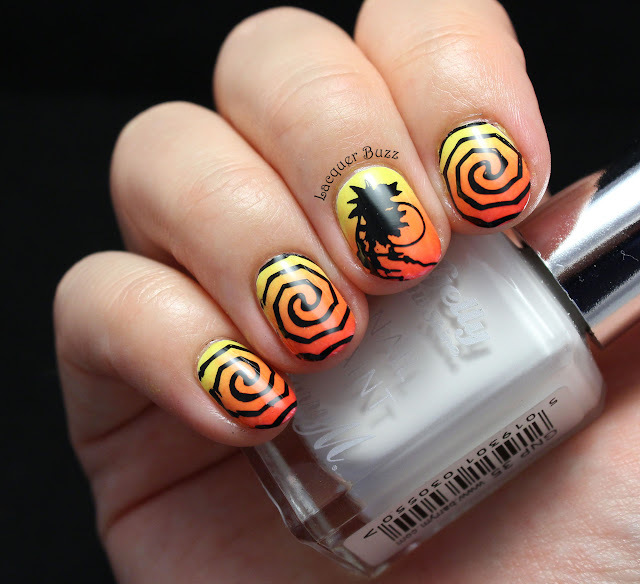 I will be still on vacation when this post goes up, so I thought I would show you the manicure I created for that. I decided to try a technique that I haven't tried before and ended up loving it. This is one that I was never excited to try out because it didn't seem that great to me. The lessons is that you have to try everything at least once to know how you feel about it. Otherwise you might be missing out on something great. Like these nails for example. Hello my lovelies! As you are reading this, I am already off for a much needed vacation. There's gonna be some road tripping, some sight seeing and some beach time as well. What I'm most excited about is getting out of the city and that true holiday feeling. In honor of all that, I created some blue nails using a very cute image and a gorgeous stamping polish. Take a look! Hello my lovelies! After a rainy weekend comes a rainy Monday. I can't complain because at least the rain made the weather cool off a bit. To fight the gloominess that everybody is feeling today, I have created some bright summer nails using a polish that I really missed using. Here's what came out! Hello my lovelies! Another sunny and hot Monday in July has arrived. I'm not complaining because work hasn't been hard today, not to mention that I have a beautiful manicure on my nails. I was in the mood for a gradient and I also had a wedding on Saturday, so I decided to do something extra sparkly. I dedicated this manicure to my lovely friend Kinga, because it was her birthday on Friday. Happy birthday, dear! Hello my lovelies! Welcome to the first Monday Blues of July! I hope your day is as nice and sunny as mine is, and if not, I have some blue nails to cheer you up. The weather was rainy all afternoon yesterday so I was in the mood for something more fall appropriate. It's nice to mix it up every once in a while, even in the summer. So I picked up one of my favorite teal blue polishes that I haven't used in ages. This is the final result. Hello my lovelies! It's a pretty hot Monday in my neck of the woods, but it's still cooler than the last week has been. I'm done with work and it seems that there's a storm coming, so I'm very happy about that. Meanwhile I'm going to show you a manicure that I've been wearing and enjoying for a few days now. It's perfect for spring and summer because of the periwinkle theme it has. Take a look! Hello my lovelies! It's Monday but it's a holiday in my country so nobody is working today. I'm really sorry for those of you that went to work today. 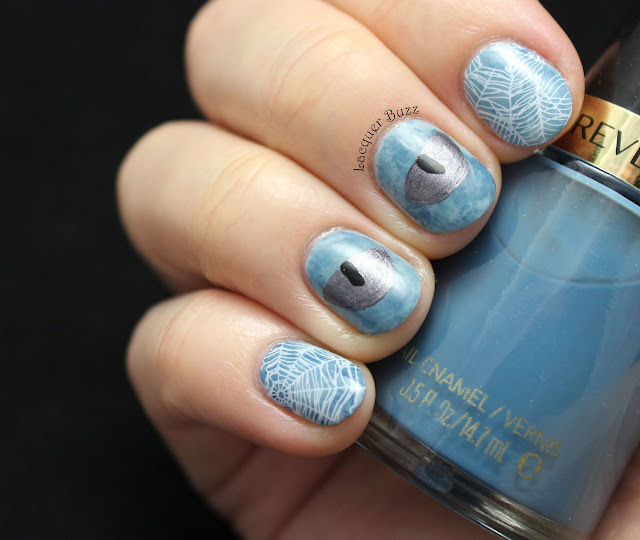 I'm gonna try to take your Monday Blues away with some nail art over a beautiful sky blue polish. The result isn't perfect but I'm still happy with how it came out. Take a look! Hello my lovelies! I guess summer is upon us since we've been getting extra hot weather with ocasional thunderstorms in the last days. I much prefer staying cool and out of the sun. Nail art is, of course, one of my favorite indoors activities. Today I'm gonna show you the rest of the Moyra stamping plates in my collection. I own 10 Moyra plates in total, and I've already reviewed 6 of them here and here. Now it's time for me to show you the remaining 4 plates. I'm gonna try showing them in order, starting with 05 Vintage. Hello my lovelies! Long time, no post. I haven't been feeling well in the past week so blogging has been on the back burner. I couldn't miss the Monday Blues though, even though it's really late in the day as I'm writing this post. 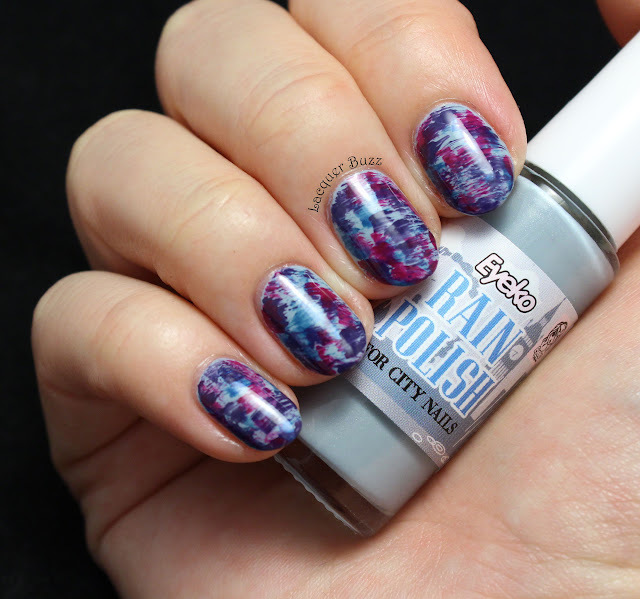 Today I have a thermal polish to show you and a cute manicure I did with it. I must admit that this polish was kind of disappointing for me because I expected more from it. It's supposed to show 3 colors, like my beloved Dance Legend Termo Trio 1, but in fact there are only two visible on the nail. Here's what I'm talking about. Hello my lovelies! I hope your Monday is as sunny as mine! The weather is absolutely perfect today so I couldn't be happier. 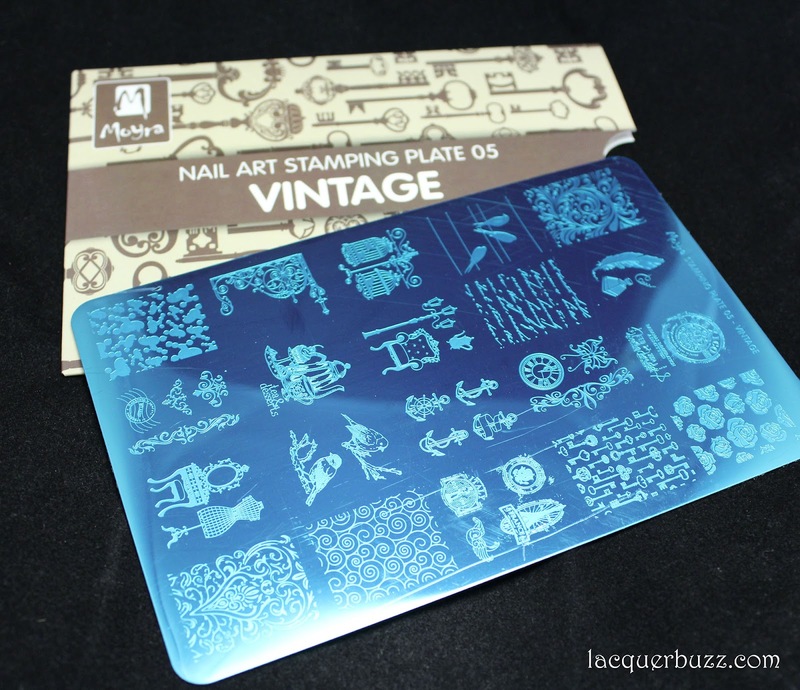 Today's post is all about a stamping plate that the lovely people over at Lady Queen sent to me. I have tried some of their nail art accessories in the past and I was quite curious to see if the stamping plates work well. I am happy to announce that all three stamping plates that I received stamp great. Today I'm showing you the first one. 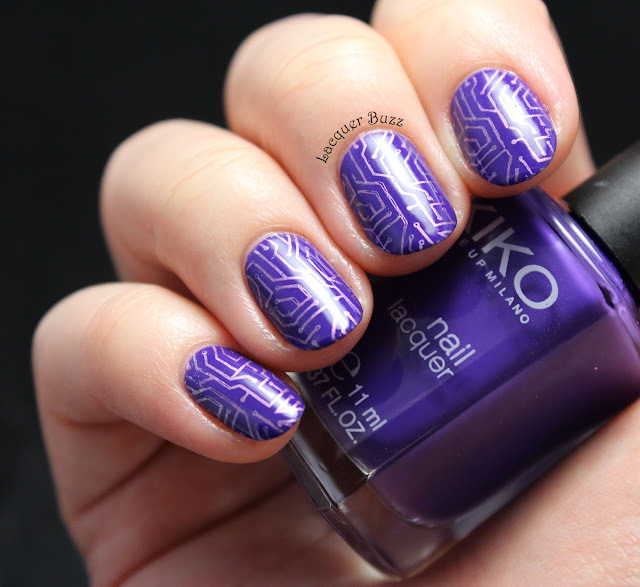 Here's the manicure I came up with using this stamping plate. Hello my lovelies! It's been a long and rainy week in my neck of the woods, and the weekend isn't bringing the sun either. So I will be mostly stuck inside, catching up on my couch time. The manicure I'm showing you today isn't something I usually do. I'm more for colorful nails and if I go for darks I go full vampy. 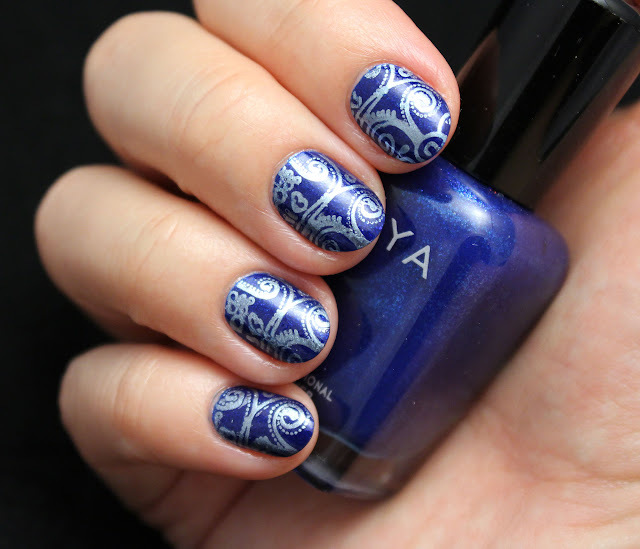 Neutrals are not my thing, but I couldn't resist the images on the 05 Vintage stamping plate from Moyra. They called for something neutral and I had just the stamping polish for that. Here's what came out. Hello my lovelies! After a sunny weekend, it's time for some Monday Blues again. I know some of you had the day off, but it was a normal Monday in my country so I went to work. I'm done with that now, so I'm gonna relax for a bit and show you some nails that I enjoyed very very much. Take a look! Hello my lovelies! It's been a long time coming, but I finally have some new Moyra plates to show you. After my initial review of 3 plates, I purchased a total of 7 more plates. They are a bit too many for one post, so I decided to break them into two more posts. Since the plates with numbers from 17 to 24 are the newest to come out, I will start with the three I own from this bunch, namely 19 Maharaja, 20 Orientalist and 24 Primavera. 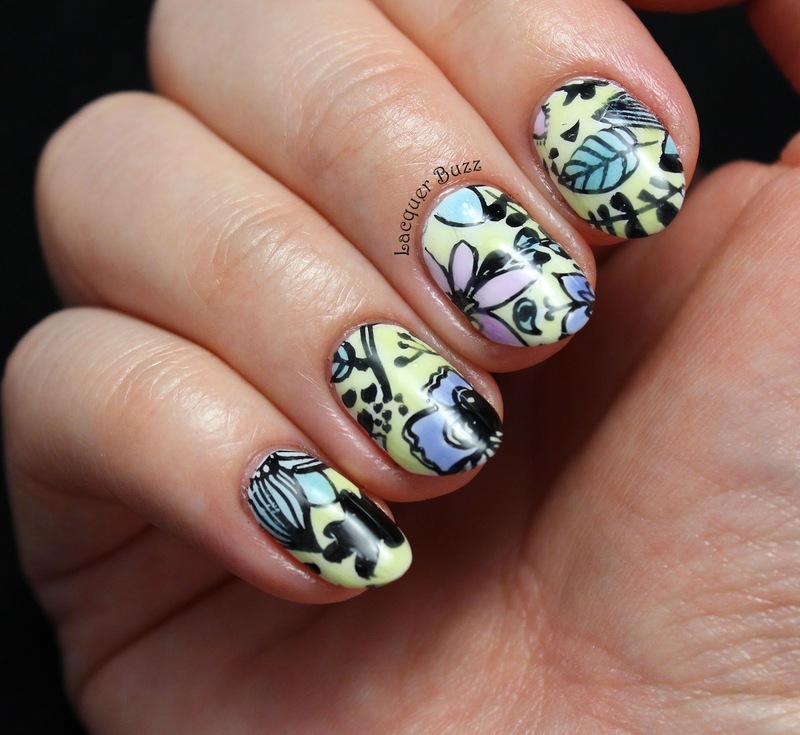 I have used all these plates for a manicure and I also did some swatches on paper using a black stamping polish. Let's go! Hello my lovelies! Today's post is coming a bit later than usual because I've had a busy Monday. 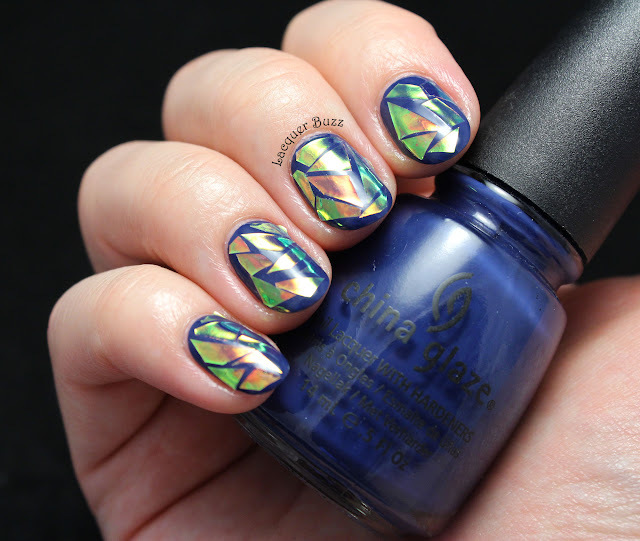 The nails I'm showing you this Monday Blues are packed with holo and they are a way to celebrate the sunny weather we've been having for a few days. 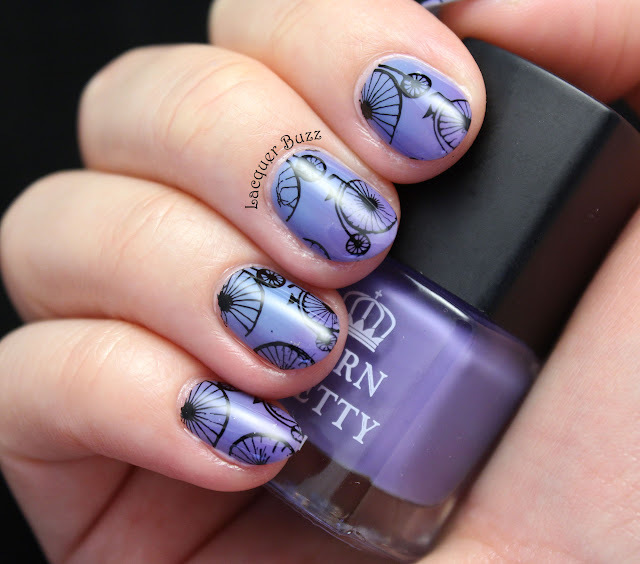 I created them using a new awesome plate and stamping polish that I was kindly sent from the Born Pretty Store. Let's take a look! Hello my lovelies! It's Saturday and the sun is shining! I couldn't be happier because I can finally spend some time outdoors after a very cold week. But before I go out, let me just show you a brand new manicure that I was really excited about. Even my boyfriend told me that it was possibly his favorite from my manicures he has seen so far. So that must mean something. Take a look! Hello my lovelies! What can be better than a Monday with little work? I'm already done with that and now I can enjoy the rest of the day. The weekend has been quite nice too, so I really have nothing to complain about. 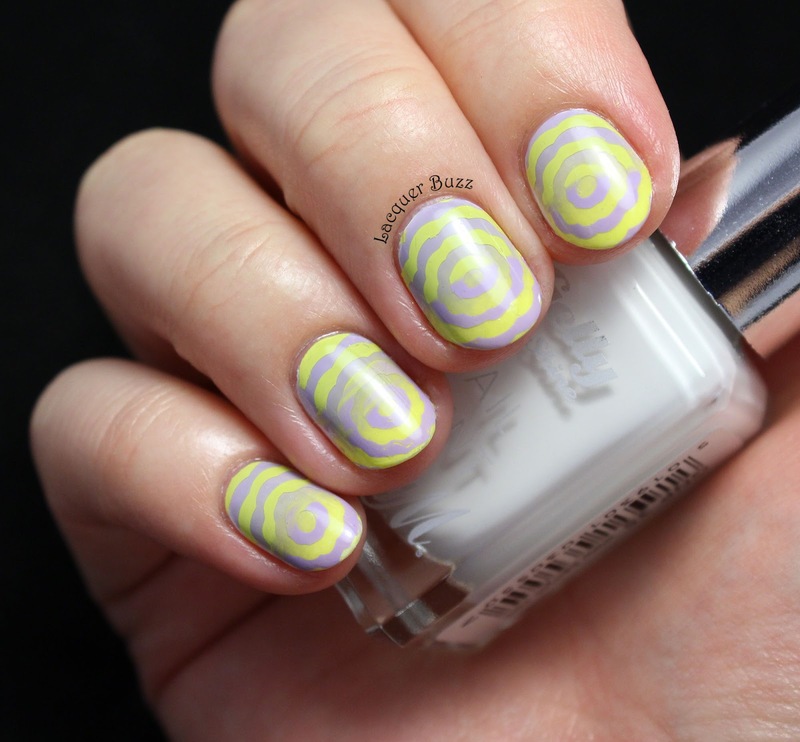 In the last month I've been doing manicures inspired by spring and summer, with bright colors and fun patterns. This time I went with something dark and elegant because I try to mix it up every once in a while. This look goes well with longer nails so I had to take advantage before shortening them again. Here we go! Hello my lovelies! Another week, another rainy weekend. It seems that the only sunny days we get lately are in the middle of the week, but just as Saturday arrives we get clouds and rain. It's also annoying that I have to complain about the weather in each post. I promise that next time I'm gonna try to talk about something else. Anyway, today's post is meant to bring the sun on the blog, even though it's not visible outside. It's the first time this year that I use neons! Hello my lovelies! It's Monday but I'm not that bummed since I had plenty of vacation time in the last week. What I do hate is the fact that it's raining cats and dogs outside. I'm so sick of this weather that makes me wanna crawl into bed in the middle of the day! Hopefully it gets better soon. Today's manicure is inspired by a kimono that my sister got me recently but that I can't wear because it's too cold and rainy outside. 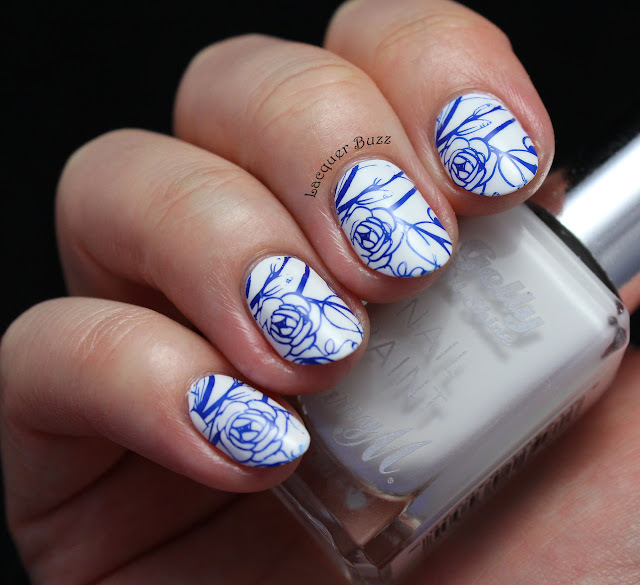 I really love the blue flowery pattern on it, so I decided to translate it on the nail. The result wasn't identical with the inspiration because I used a more delicate image but I liked it a lot. Hello my lovelies! This week was great for me because I had a lot of free time. Unfortunately, the weekend is here and that means it's back to work soon. Oh well, at least there are still two free days ahead of me. Today I have a very springy manicure to show you. 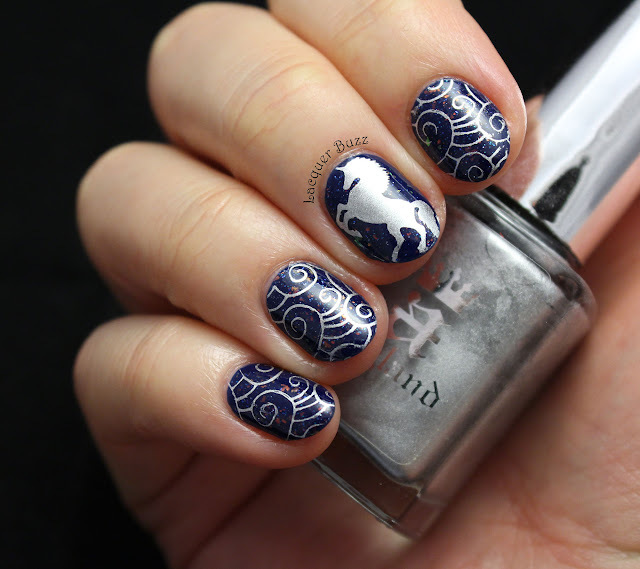 I also added some elegant stamping to it, which makes for a very interesting combo in my opinion. Take a look! Hello my lovelies! It's still a holiday in my country, so today is a day off for me. I couldn't expect more from a Monday! The weather isn't great and I think it's about to rain, so indoors activities are in order. I don't mind because I've been looking forward to get some rest and catch up on my reading and TV shows. Anyway, today I'm bringing the first Monday Blues of May. These nails have been an experiment that I pretty much consider as failed, not because of the result but because of the creation process. It's the first time I try to do some Sharpie nails and this is the result. Hello my lovelies! It's Saturday and it's Easter weekend in my country, so I decided to post some Easter themed nails even though a lot of you have already celebrated this holiday. 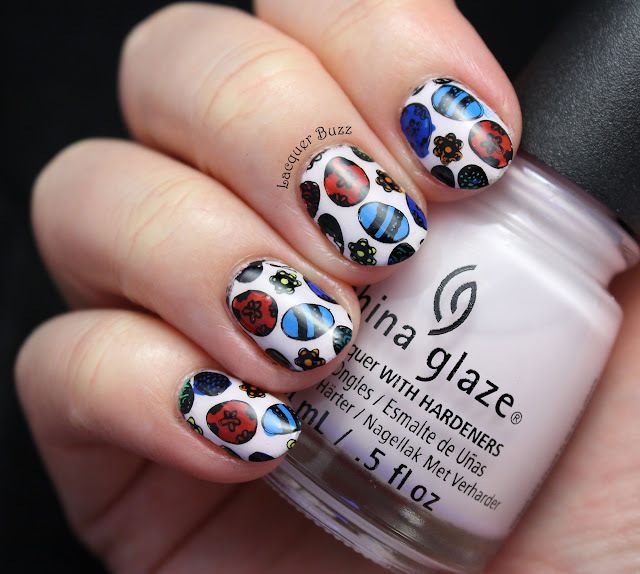 I don't usually do any nails for this holiday because it's not one I'm particularly fond of, but one of my new Moyra plates had a really cute Easter egg design that inspired me so I decided to do some decals. The plate I'm talking about is 24 Primavera and it's one of the newest they came out with. I promise to do a review as soon as I can but until then take a look at this manicure! Hello my lovelies! It's unusual for me to post on a Thursday, but I've had a bit of free time lately and I've been doing more nail art than usual. As a consequence, I have a few manicures to show you and can't wait to post them. 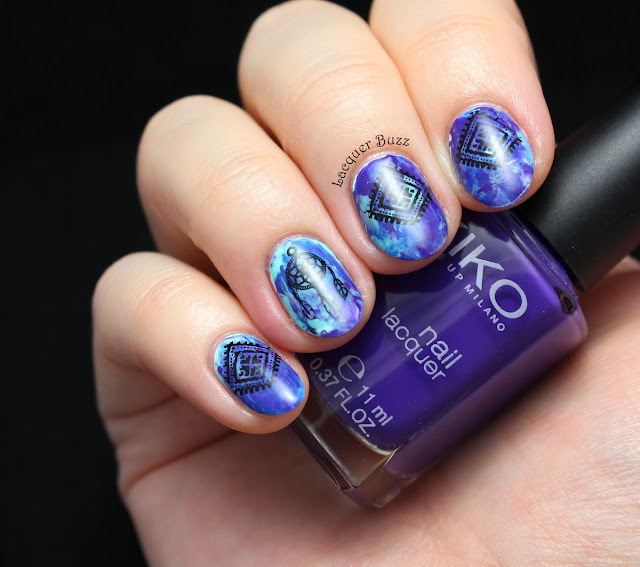 That's why I decided to write this post and show you some psychedelic nails I did last week. I was really happy with how these came out because the result was very similar with what I had in my head. That doesn't always happen, especially with such an intricate design. 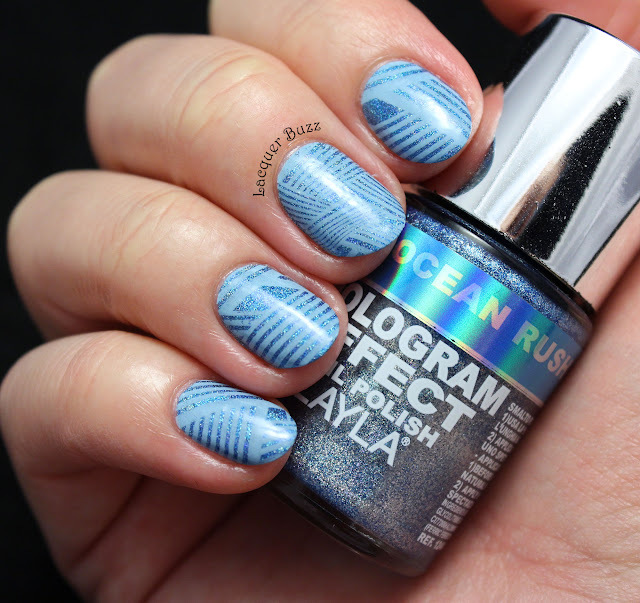 Anyway, I'm very happy to present the reciprocal gradient stamping manicure. Hello my lovelies! It's a cold and rainy Monday in my neck of the woods but I've got a manicure that will instantly cheer us up. I'm honestly very happy with how this turned out, so happy that I've been using the images as my desktop background for the past week. This manicure is the first where I've used a new for me technique. 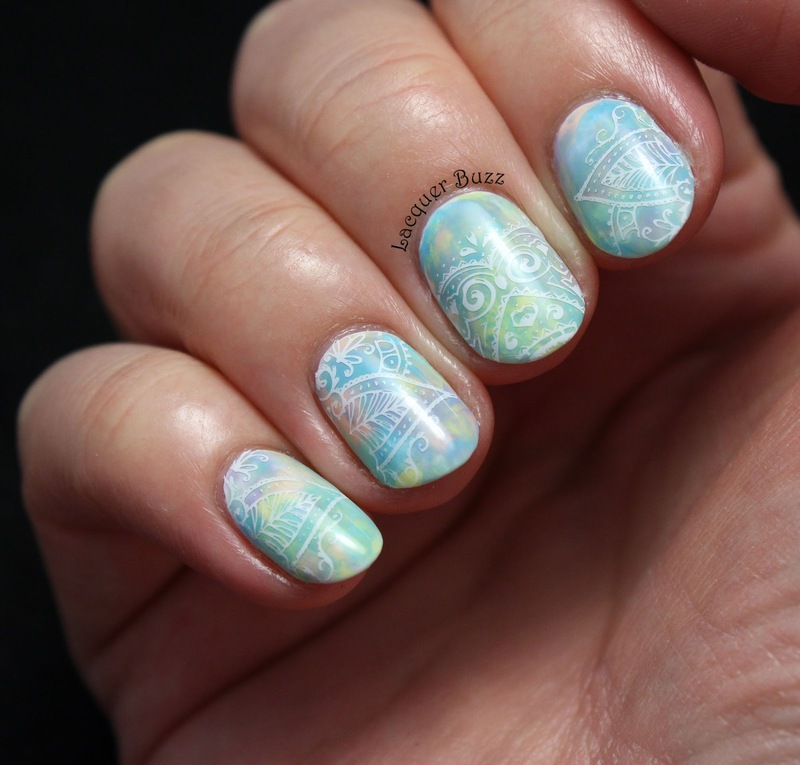 I don't know what the official name for this is, some call it squishy, others call it smooshy, but basically it involves a stamper for applying your colors on the nail. It's been around for a while now and it seems that a lot of people have been using this technique. I've seen a lot of nails done this way in the last few weeks, so I decided to try it out. Here's the result! Hello my lovelies! It's Saturday, so I had to squeeze in a post between my other relaxing activities. 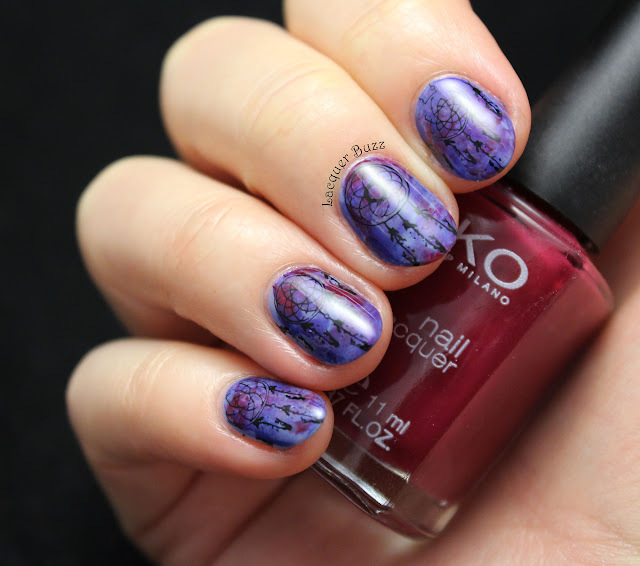 Today's post is all about a holo polish that I recently got from my friend Kinga's blog sale. I had already borrowed it last year and showed it to you here, so when she decided to part with it I had to bring it home. It seems that it's holo week on the blog because Monday's post had some holo in it too. I guess it's only fair because the sun has been shining all week. Anyway, let's get to the nails! Hello my lovelies! It's Monday but that's not so bad because the sun is shining and spring is in full bloom. To celebrate the sun I have a bit of holo in today's manicure. It's also spring appropriate because the shades are quite soft. The base color is a polish that I borrowed from my friend Kinga last year and decided to bring home with me at her last blog sale. I think it's really pretty! Hello my lovelies! It's Saturday and the weather is just lovely, so I hope to spend some time outdoor. But I couldn't leave the blog without any posts this weekend so here I am. 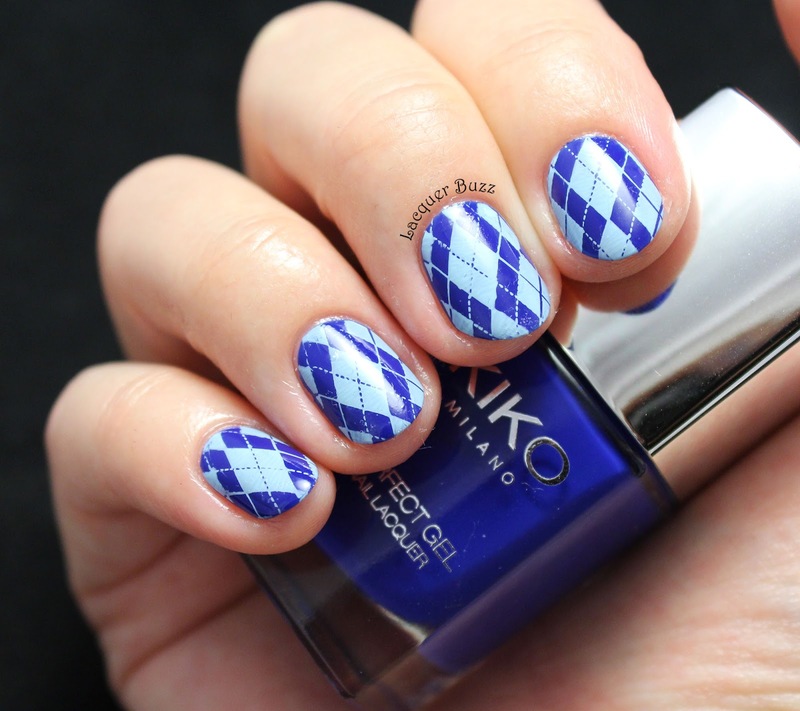 Today's manicure is pretty simple to create but it introduces a few polishes that are new in my collection. 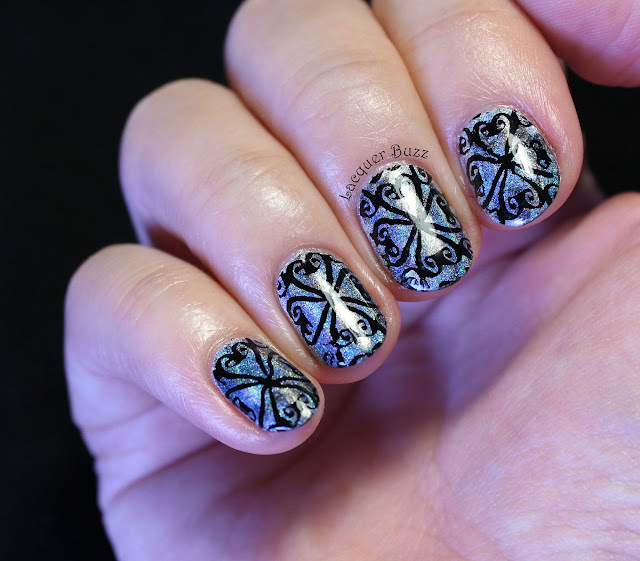 I also used a cool stamping plate that I wanted since forever. Let's take a look! Hello my lovelies! How are you on this fine Monday? I didn't have much work to do today so I kinda feel like I'm on holiday. Unfortunately, it's been raining for a couple of days around here so summer is only present on my nails. Luckily this manicure instantly cheers me up when I look at it because it's such a gorgeous color. Plus there are seashells involved so it really can't get any better. I'm dreaming of the sea already. Take a look! Hello my lovelies! It's a beautiful Saturday in my neck of the woods and I decided to spend my morning doing nail related stuff. I had a ton of unedited pictures of manicures that are now taken care of and a few YouTube videos from my favorite nail artists to watch. But now I'm going to write this post to show you my latest work of art. I did these nails a couple of days ago because I missed doing a leadlight manicure and been wanting to do one in weeks. I finally gathered up some free time and got to work. I'm really pleased with the result! Hello my lovelies! Another week has passed and I haven't managed to post anything since the last Monday Blues. I had lots of work to do and then decided to relax during the weekend. But today I'm returning with a very trendy manicure. I finally got myself some fancy foil and was able to jump on the glass nails trend. The experience was pretty controversial for me and I'm gonna tell you all about it in this post. I try to be honest on my blog, so I can't stand painting a pretty picture when the truth isn't exactly that. Anyway, this nail art foil was kindly sent to me by LadyQueen. Here's my result!